Russian River Blues Festival: The festival takes place every year during the summer at Johnson’s Beach in Guerneville. Music, food, and drink (wine, of course) abound! Listen from your riverside beach chair or from your raft or kayak on the river. Armstrong Redwoods State Reserve Area : Want to add even more adventure to your Russian River rafting or kayking excursion? Well then the Armstrong Redwoods are the place to do it. From hiking and mountain biking to viewing the abundant wildlife all of your outdoor needs will be met here. The camping at adjacent Austin Creek is highly recommended also. 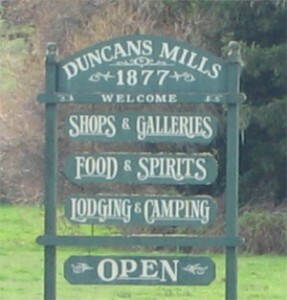 Duncans Mills: This small riverside town on the banks of the Russian River along Route 116 in Sonoma County has retained its charm through the ages. Established in 1877 as a stop for the North Pacific Coast Railroad. There’s plenty to keep you busy in this tiny town from art galleries, gourmet dining, cute B&Bs, wine tasting and antique shops. Goat Rock Beach: This well known landmark is worth a gander. From the parking lot you can stroll down the beach on the sandy strand between the Pacific Ocean and the Mouth of the Russian River, checkout the intense waves that area is known for and possibly see some seals napping at the waters edge. Half a mile south of Jenner on Hwy One. Fort Ross: An early 1800s Russian trading colony that is now a museum and state park. Take a guided tour and have a picnic overlooking the Pacific Ocean. 12 miles north of Jenner on Hwy One. California Whitewater is currently seeking a Featured Outfitter for the Russian River. Please visit our California Outfitters page for more information. There are more opportunities than you could possibly imagine to sample wines from the Sonoma Wine Country and Alexander Valley…no really, over 190 wineries alone! The Russian River region’s wine growing appellations are known to produce some of the finest grapes in the world. Conditions on rivers can and do change quickly as weather, upstream dam fluctuations, and other phenomenon occur. to check flows & conditions and be realistic about your skill level in relation to the challenge of the river at its current level.